Lawn And Garden Products (Yantai) Co., Ltd.
Motor :550w Volume:125l. No.74038:1200*750*1350(mm) 55kg 810*680*420(mm). We can sell 8 m3 10 m3 12 m3 transmixer .We supply spare parts of it. ıt is changing. Short on time? 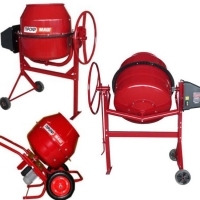 Let concrete-mixers sellers contact you. Model JF-260JF-300JF-350 Power Diesel engine 178f Diesel engine 178 fDiesel engine 178f /2.2kw electric motor/2.2kw electric motor /2.2kw electric motor Feed capacity (l)200240280 Discharge capacity (l)150170190 Dimension (mm)1900x1170x11501900x1170x11501900x1170x1150 Net weight (kg)270290310 Max. Volume of mixed(l)150170190 Gross weight (kg)290310330 Qty for 20gp/40hq12/2612/2612/26. Cement mixer. Huaian Kingdia Machinery & Equipment Co., Ltd.
Capacity(L): 120;130;140;150;160;180 Voltage/frequnce: 230V, 50HZ/120V.60HZ Power: 375/550/650/800W Motor speed (RPM): 1450/1680 Cast iron crown gear or nylon crown gear. Caton size(mm): 730*700*443; Weight (N/G)(KG): 49/53.5;51/55;52.5/55. Different colour and types;easy to handle and durable.Widely used in industrial. Without hopper, chassis: heavy steel sections have been used for durability & four pneumatic wheel is provided. Power unit: (1) 7/5 h.P. Four stroke air cooled diesel engine or (2)(2) 5 h.P. Electric motor Mixing drum: specially shaped mixing blades are provided for efficient mixing. Concrete Mixers Drum: Constructed of rolled steel plateand steel end plateswelded together with machined roller path.A central cast iron gear ring is fitted in segments.Special abrasiveresisting blades are provided for perfect mix. Strip: The fully automatic loader is designed to give a steep angle of feed. A shakeris is fitted to assist the discharge. Watertank:Self measuring type is fitted on the frame of the mixer. Transmission:Suitably encased bushed roller chain with machine cutsprokets driving directly on the drive shaft. In the drum roller assembly each roler is mounted with renewable bearings. Chassis:Strong all steel welded constructions with swivelling front axle provided with four iron wheels. Luberication is by means of grease ripples. Note:All moving parts are enclosed affording complete protection to operator and immunity from weather. JS series concrete mixer JS500 750 1000 1500 2000 As a double-horizontal-shaft forced type concrete mixer, the JS series concrete mixer has been provided with double superiorities, that is single-independent work and combinatorial function with PL series burden machine, also provide the matching engine for mixing plant, it applies to all kinds of large, middle and small scale prefabricated-component factory as well as industry and Civil Construction like highway railway bridge irrigation jetty and so on. With a high efficiency, this machine can be applied to all kinds of material, such as harsh concrete plastic concrete lightweight aggregate concrete and others. With reasonable structure, novelty layout and easy operation and maintenance, we can make design according to special requirements for meeting the demand of customers. Wuhu Cimc Ruijiang Automotive Co., Ltd.